Everlash Professional Eye Shadow Set 4 (also known as Everlash Color Kit Eyeshadow #04) palette comes with 4 shades in coordinated light to dark colors. The EVERLASH eyeshadows are characterized by the fact that they do not settle in the eyelid fold. 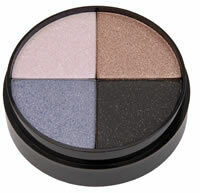 This new generation of eye-catching eyeshadows reflect the light with a special and elegant pearl effect. So smaller wrinkles are elegantly concealed.